rec. live, 9-10 October 2009 (Schwanengesang); 7-8 January 2011 (Concerto), Hilbert Circle Theatre, Indianapolis. Reviewed as a 16-Bit download. This is Naxos’s second recording of the orchestral music of Claude Baker and as such presents something of a coup: a concerto recording by Marc-André Hamelin away from his Hyperion comfort zone – and a live one at that. Baker has a formidable reputation as an educator – indeed in a long tenure as composer-in residence to the St Louis Symphony Orchestra (1991-9) he made a name for himself through his involvement in a range of community projects, long before such activities became fashionable. The orchestral works that featured on the earlier Naxos release included pieces inspired by the writers Hermann Hesse (The Glass-Bead Game) and Walt Whitman (The Mystic Trumpeter – apparently this work is incorporated into the concerto included here). I haven’t heard this disc but was most interested to read Paul Corfield Godfrey’s review on this site, which expressed concern with Baker’s compulsive use of quotation, despite broadly welcoming the music. Referring to the notes I made during two listens to the new issue I can only echo my colleague’s remarks about Baker’s ‘collage’ technique. The fragmented nature of much of the content and the liberal use of quotation detracts from this listener’s ability to perceive any individual stylistic fingerprint. I have nothing against quotation per se (or collage-type structures), but in both works here I feel the structure is often so elusive that listening becomes a game of ‘spot the quotation/allusion’. 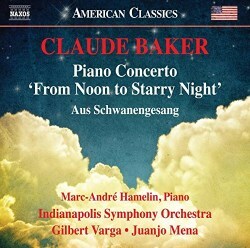 In his Piano Concerto ‘From Noon to Starry Night’ Baker again takes Whitman as a starting point. While the five sections of this work are each named after particular poems ‘From noon…’, it is effectively a three movement work, the first and fourth sections effectively constituting brief ‘prefaces’ to the second and fifth panels respectively. The work commences ominously with the Drum Taps of the title, alternating with cascading piano, rapid repeating chords, Varèsian brass and ringing percussion. This morphs into the more reflective Silent Sun, a more reflective episode characterised by allusions to Thoreau from Ives’ Concord Sonata, prior to repetitive, rippled motifs that to my ears recall Valentin Silvestrov. In the third movement, Lilacs, the orchestral gestures are more brassy and assertive; the piano provides a more restrained commentary. As the movement continues, the ghostly presences of Richard Strauss and Messiaen emerge from the mist, prior to its enigmatic, fragmented conclusion. And it’s with these dislocated references that I begin to struggle - they undermine what appears (to me at least) to be a rather fragile structure. Hamelin is called upon to do his virtuosic thing in the tiny toccata Dalliances, evoking eagles ‘taloning’ in mid-air; this leads immediately to the finale, a twelve-minute panel called Ecstatic Ghost, where muted trumpets make less-than-subtle allusions to Ives again, this time The Unanswered Question. It might be evocative and suggestive on the surface but as a dedicated Ivesian of 40 years I find it faux –transcendental and just too obvious. These references are made repeatedly with slight modifications. At some point, Ives becomes Messiaen, the collage material now from the Vingt Régards and Turangalîla. Hamelin here produces some garish colours from the lowest register of the piano. I happily admit to being a huge admirer of the soloist, whose taste and judgement regarding repertoire is pretty reliable, but I’m afraid this work has eluded me. Baker produces some teasing and tantalising sounds for sure, but they led me, alas, into a cul-de-sac. In this live recording, the orchestra’s sound image is truthful, but I found a drier sound from the top notes of the piano. (Perhaps this was just the download?) The audience applause for this piece certainly seems enthusiastic, so what do I know anyway? Aus Schwanengesang from 9 years earlier inevitably refers to the Schubert song-cycle, and specifically to the six Heine settings that feature therein. I’m afraid I found this work even more diffuse than the concerto. It was composed as a memorial to Peter Worsley, a scion behind the scenes of the North Carolina Symphony Orchestra – and Baker saw in Heine’s words a reflection of Worsley’s lifelong love of the sea as well as the melancholy of lost love. In his note Baker also discusses Worsley’s ready wit and explains how he has tried to incorporate elements of Haydn’s quirky humour into the score as a hommage. In the first of the five short movements, sylvan rustlings and flutterings compete with fragments of (Schubert’s) Das Fischermädchen; the following panel combines references to both An Meer and Die Stadt with threatening drum tattoos, while Der Doppelgänger presents a melodic sequence that uncannily resembles the theme from Anton von Webern’s Passacaglia, Op 1. Ihr Bild depicts the traumatic realisation of the beloved’s absence in sound form, while in the concluding Der Atlas defiant wisps of quirky orchestration lighten the texture – presumably this is the spirit of Haydn. Again there are some attractive sonics in the work (along with some more jagged effects). For me, alas, the whole just doesn’t cohere – the form of the work may look good on paper but personally I found the work rather laboured and ultimately too fractured. There are myriad allusions in the work, but have Baker’s influences been fully absorbed? It’s a moot point, but ultimately it’s a question the composer’s other listeners need to answer. The Indianapolis Symphony Orchestra perform both works with tangible enthusiasm under Gilbert Varga (in the Concerto) and Juanjo Mena; there are certainly some spirited solo contributions from individual players, most obviously the trumpets in the Piano Concerto. Marc-André Hamelin’s presence will certainly raise the profile of this disc and his contribution to the first work is characteristically bold, unfazed and virtuosic. Recording standards are very high, notwithstanding my earlier caveats about the piano sound. I feel sure there will be some collectors out there, who derive more satisfaction from this issue than I did.